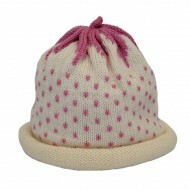 Children's knitted pink and cream strawberry hat handmade in Bath. 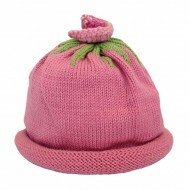 This makes the perfect g..
Children's knitted light pink flower hat handmade in Bath. This makes the perfect gift! .. 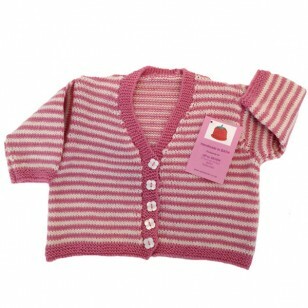 This sweet little pink and cream v-neck baby cardigan is carefully handknitted in Bath using machine washable Merino wool. 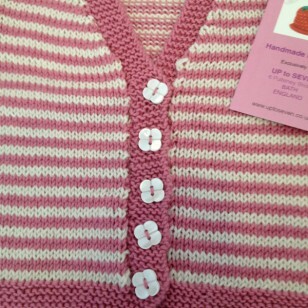 Featuring front button closure. This unique jacket makes a perfect gift and can be matched with our other handmade products. 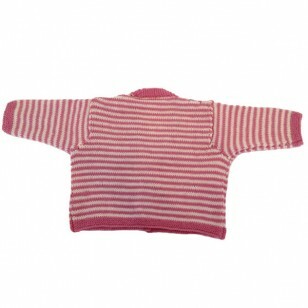 Pure wool, machine washable at 30 degrees. Handmade locally in Bath this unique and vibrant collection is designed and made exclusively for Up to Seven. This design is handmade to order, please allow up to 21 days for delivery.